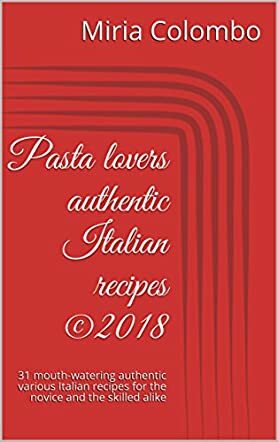 Pasta Lovers Authentic Italian Recipes (31 Mouth-Watering Authentic Various Italian Recipes For The Novice And The Skilled Alike) by Miria Colombo is not just a cookbook, but also a book that is meant to please the taste buds, and also the spirit. There are many different recipes that all have different flavors, appearances, and richness to them, yet they all share the common theme of being authentic Italian recipes. Are you ready to feed not only your stomach, but also your spirit? Pasta Lovers Authentic Italian Recipes by Miria Colombo is a well organized cookbook that begins with a table of contents that lists the name of the dish and also a short description of each recipe; one of the many recipes listed on the table of contents was “Spaghetti aglio e olio e peperoncino (Spaghetti with garlic, olive oil and hot pepper)”. This table of contents was very helpful to me as it allowed me to find the recipe I was looking for quickly and without any fuss. The recipes themselves had a nice layout that included a color image, the title of the recipe, the number of servings, the required ingredients, the instructions on how to make the recipe, and then the words "Bon Appetit!" I found this layout to be concise and easy to follow in order to make the recipes. The only thing that would have made it easier is if the instructions were numbered instead of being written in paragraph form. Overall, my favorite recipe ended up being Ciambelline al marsala (mini Italian donuts) and I was left hoping that the author will decide to write similar books for other types of food!